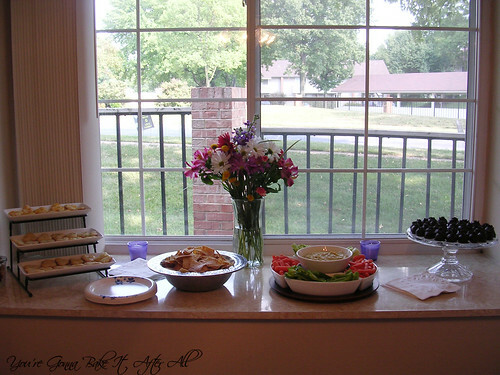 Bob and I threw an appetizers and desserts party at our townhouse on Sunday night. We called the party "Hello and Goodbye" to allow our friends and family to say "hello" and "goodbye" to our townhouse before we start packing up for the move to our new home. Everyone was asked to bring their favorite appetizer or dessert to share, and I made a few that I've been wanting to try forever. 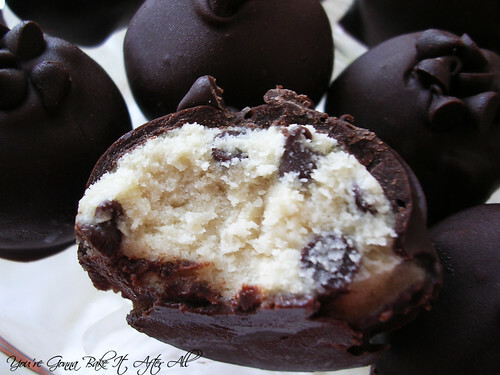 I've been wanting to try these Cookie Dough Truffles for a long time. I LOVE cookie dough - seriously I'd eat a whole batch of it right out of the bowl. The great thing about these truffles is that they don't contain raw eggs. I know my pregnant and nursing guests appreciated that! I thought these truffles tasted amazing! They were a bit more work than I anticipated, but I've indicated some tips in the recipe below. I know at least one reader who had some trouble with chocolate-dipping the Oreo Truffles, so hopefully these tips will work for those as well. 1. Combine the butter and sugar in a mixing bowl and cream on medium-high speed until light and fluffy, about 2 minutes. 2. Beat in the flour, sweetened condensed milk, and vanilla until incorporated and smooth. Stir in the chocolate chips. Cover with plastic wrap and refrigerate until the mixture has firmed up enough to form balls. 3. Shape the chilled cookie dough mixture into 1-1½ inch balls. Place on a baking sheet lined with wax paper. Cover loosely, transfer the pan to the freezer and chill for 1-2 hours. 4. When ready to dip the truffles, melt the chopped chocolate in a heatproof bowl set over a pot of simmering water or very carefully in the microwave. The key to easily dipping the truffles is to the correct consistency of chocolate - make sure your chocolate melted is fairly thin. Mine was not, so I added tiny amounts of vegetable shortening (Crisco) to achieve the correct consistency. I think I added about a tablespoon to the chocolate mixture, perhaps a tad more. 5. Dip each chilled truffle, one at a time, coating in chocolate and shaking gently to remove the excess. (My aunt helped with this part!) To facilitate dipping, we took a wooden kabob skewer and used it to pick up a truffle, then swirled the truffle in the chocolate, then transfered the dipped truffle to a wax-paper lined surface. We twisted the skewer back and forth to remove it from the truffle. You can also use a fork to help remove the skewer. The optional mini-chocolate chip garnish will hide any imperfections left behind. Alternatively, you can use two forks to roll the truffle around in the chocolate and then, lifting the truffle out with the forks, let the excess chocolate run off. Note: If at any point during dipping, the cookie dough balls become too soft, return to the freezer to chill for 30 minutes. 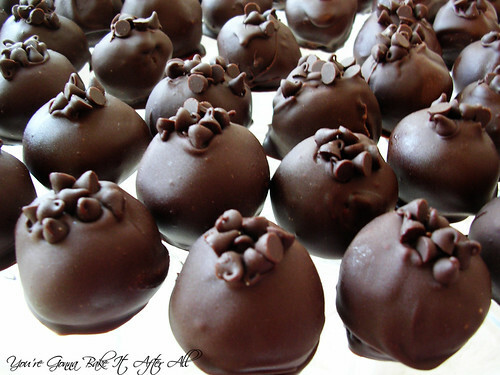 If using mini chocolate chips for garnish, sprinkle on top quickly after dipping each truffle before the chocolate sets. 6. Once all the truffles have been dipped, store them in the refrigerator (or freezer) until ready to serve. Yours turned out very gourmet looking--I made a similar recipe last year to bring in to one of my college classes, and everyone said they were to-die-for! These are definitely one of my absolute favorite treats :) Good call with the chocolate chip garnish to hide the hole from the skewer - I've tried to cover it up with more chocolate but they never come out very pretty. Yum. I love cookie dough truffles. I make a similar recipe with a little bit of orange in (it sounds weird at first, but my friend introduced me to it in chocolate chip cookies and since then I've been hooked!) although yours look so much more gorgeous than mine. I love what you did with the chips on top so the next time I make them I'm gonna steal that trick. These look amazing! I am sure I couldn't stop at one! I love that stand you have on the left of the photo - the one with the three ties? Hi Kylee - I actually got that stand that same day at Bed, Bath, & Beyond. I had been wanting a 3-tiered serving platter for a long time! Mmm, I SO wish I had a couple of these right now! The mini-chocolate chips on top are adorable too. Good luck with your move! I loved these truffles. Not only did they look beautiful, they tasted amazing!! I did a great job on dipping. All the treats at the party were delicious. Appetizer and dessert parties are my favorite! Those truffles look amazing. Chocolate dipping any truffles is a little annoying... we used to do it with peanut butter truffles and eventually ended up pouring chocolate over them or making them in cups instead. So worth it though! I think I will try the pizza first. The truffles look great too but, I have 4 kids and the thought of all that work, only to have them gobble them down in 5 minutes... hmmmm. I'll be back. I'm Following you now.